This glaring disparity led the Salwen family of four, caught up like so many other Americans in this age of consumption and waste, to follow Hannah’s urge to do something, to finally just do something. And so they embarked on an incredible journey together from which there would be no turning back. They decided to sell their Atlanta mansion, downsize to a house half its size, and give half of their profits to a worthy charity. At first it was an outlandish scheme. “What, are you crazy? No way!” Then it was a challenge. “We are TOTALLY doing this.” Each week they met over dinner to discuss their plan. It would transport them across the globe and well out of their comfort zone. Along the way they would inspire so many others wrestling with the same questions: Do I give enough? How much is enough? How can I make an impact in the world? In the end the Salwens’ journey would bring them closer as a family, as they discovered, together, that half could be so much more. For their family project, the Salwen family is investing in the Hunger Project. For more information about that project and how you can create your own, visit www.thepowerofhalf.com. $1 of each copy sold will be donated to Rebuilding Together, serving America’s low-income home-owners and providing critical repairs at no charge to those with the greatest need. For more information, visit http://www.rebuildingtogether.org/. I recently received a copy of the true story of the Salwen family entited The Power of Half. This book, written by Kevin Salwen and his daughter Hannah, chronicles the family’s bold move to embrace the true meaning of “giving” by selling their home and using half of the proceeds to fund projects in Ghana. When I began reading the book I was drawn in immediately and couldn’t wait to see how their story developed. Kevin begins this book by outlining, very honestly, both that his family was very comfortable financially and that, while they had donated to charity in the past and tried to instill this value in their children, that they never had truly embraced the concept of “giving” in its purest form. This worldview changed, however, on a ride home one evening when fifteen-year-old Hannah had a revelation. She saw a homeless man with a sign asking for help and, upon looking behind her, realized that if the man in the expensive car behind them were to sell it, he could help the homeless man and still have a car for himself. Her realization that helping others could be much larger than what her family has previously done starts the ball rolling. Kevin is also quite honest in his reflection about his own trepidation of making a large step, as a family, to help others as well as his younger son’s negativity when the family begins talking about the best way to help others. As a family, after much discussion, they decide to sell their home and literally give half of the proceeds (approximately $800,000) to help people in a third-world country. After choosing the country of Ghana, they interview a number of charities and decide to donate to the Hunger Project. They end up going to Ghana and seeing examples of how their donation will help others. They continue to reflect, as a family, and discover how this experience has helped them to grow. While people may think they cannot help others because they don’t have the funds to do so, the Salwen’s discuss how anyone can help others. If you don’t have financial resources, they suggest, you could take half of the time you spend in a week watching television to volunteer somewhere in the community. 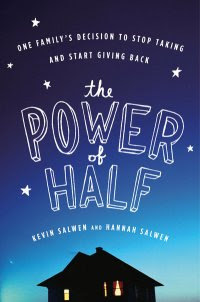 Through the book, Hannah has written suggestions, and reflective questions, on how people can embrace “the power of half” and choose a cause where they want to make a difference. It also needs to be said that the Salwen’s are honest in some of the roadblocks they hit along their journey. Kevin talks about how some of their friends and relatives baulked at their plans to downsize and support a charity, while some strangers expressed negativity and hostility when the Salwen’s story was shown on national television. The largest hurdle that they had to overcome was when their house did not sell and they had to decide if, and how, they could make the first of the promised contributions to Hunger Now. Overall, I was amazed and enthralled by this book. It caused me to reflect on my own charitable giving and look at how I could help and support others in the world who need assistance for a better quality of life. I felt a real connection to this book because, in our communities, many groups (schools, social clubs etc) promote the idea of “character development” and how it can be instilled in others. Since I received this book, I’ve already told two individuals about it because I was amazed by this story and both have asked for the information so they can get a copy and read it! If I had any criticisms, there were be only two and both are small. The first one has to do with all of the references to statistics, quotations by famous people and references to news articles. I really wish, in the book, that the sources of these materials had been provided. I would have liked a set of footnotes at the end of the book so I could go and read some of these books and news articles that were the source of this information. I was disappointed that I could do more reading based on this mentioned in the book because they didn’t provide the resources for me to do so. The other criticism is one that probably could not have been helped. The book ends with an epilogue in the Spring of 2009. I wish there would have been more in the epilogue and it would have told the reader what is happening up to today. That being said, it may not have been possible due to publishing timelines. The good news is that I plan to check out the Salwen’s website, http://www.thepowerofhalf.com to see if there are any more updates. Overall, I would recommend this book to anyone interest in a story about human interest and empowerment through a willingness to help others! I wish I could meet the Salwen family and talk to them about their experience because I think it is really inspirational!